At New York's Rockefeller Center on Sunday, throngs of Mario fans lined up and waited for hours outside the Nintendo World Store to celebrate the store's renovation and the 25th anniversary of classic platformer Super Mario Bros. for the Nintendo Entertainment System. 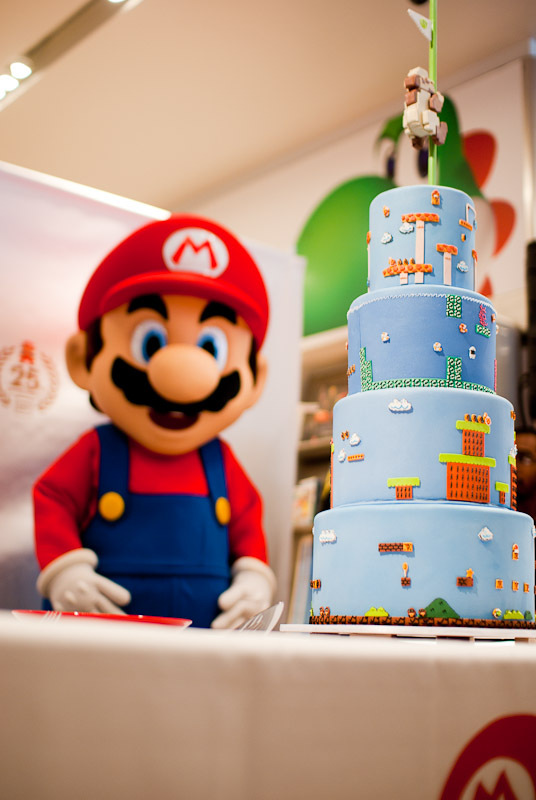 The public event, which lasted from noon to 5 p.m., centered around the cake-cutting ceremony of a towering Super Mario Bros.-themed cake, which Nintendo's public relations insisted to the journalists in attendance was a sight we "won't want to miss." 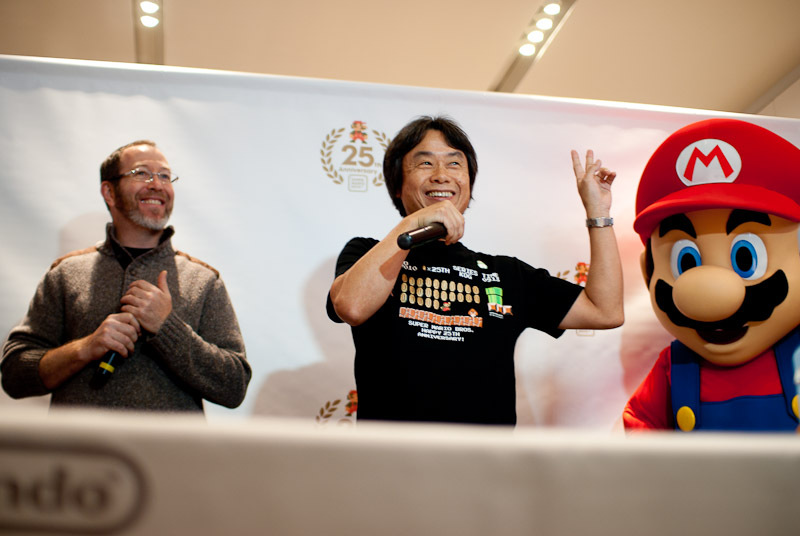 Indeed, because at 2 p.m., in the crowded top floor of the Nintendo World Store, Nintendo of America president Reggie Fils-Aime took the stage to introduce surprise guest, Mario creator Shigeru Miyamoto. 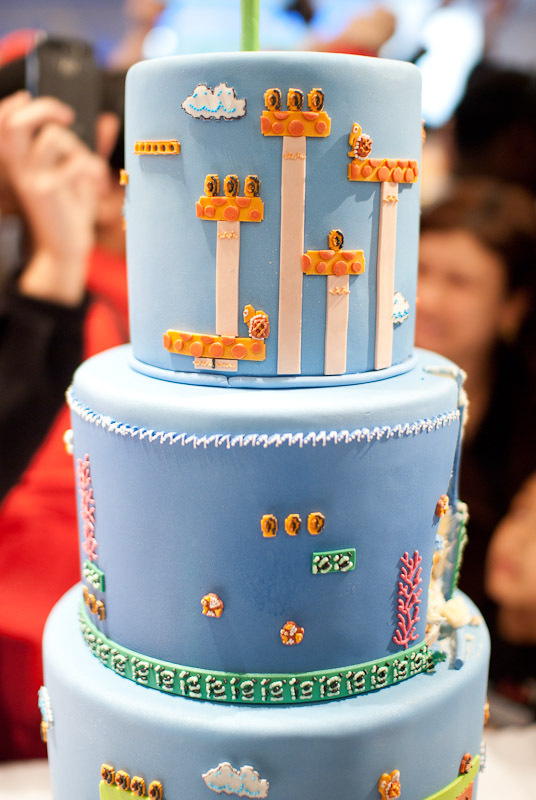 "As we honor Super Mario Bros., we thought it was fitting to not only have this wonderful anniversary cake, but also to have on hand the creator of Super Mario Bros.," said Fils-Aime to raucous applause and ear-splitting hoots and hollers. Mr. Miyamoto, speaking through a translator, thanked everyone for coming. "Mario is something that becomes enjoyable when all of you play the game," he said. "We need you to play the games to make him interesting and fun, so I really want to encourage you all to keep playing the games and keep making him fun." Later, I asked Marc Franklin, Nintendo's director of public relations, about Mr. Miyamoto's unannounced appearance. "Nintendo always likes to surprise people," Franklin said, grinning slyly. "We always want to put smiles on people's faces, so we're just happy that he was available to be here, celebrate with the fans, and recognize the milestone of Super Mario Bros.' 25th anniversary. It just wouldn't be complete without the creator of the game." 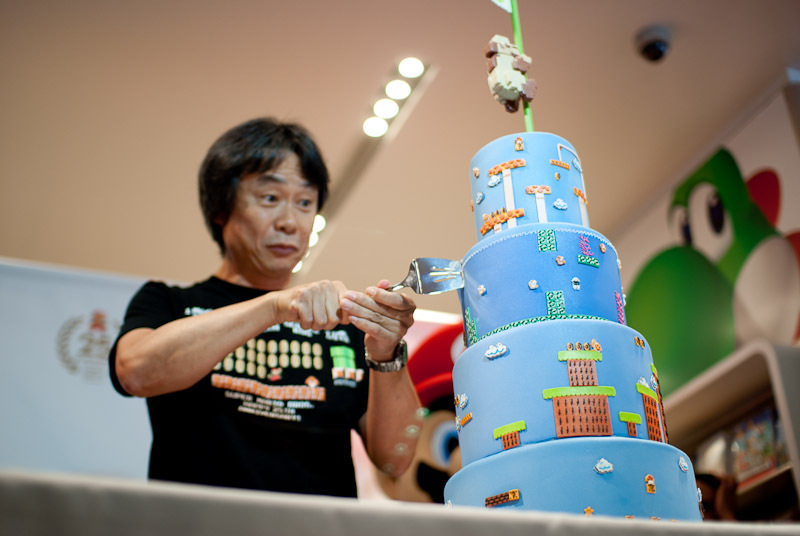 Following the cutting of the cake, which both Mr. Miyamoto and Fils-Aime tasted (disappointingly, they did not feed it to each other bride-and-groom style), Mr. Miyamoto attentively watched a speed-run demonstration of the game. 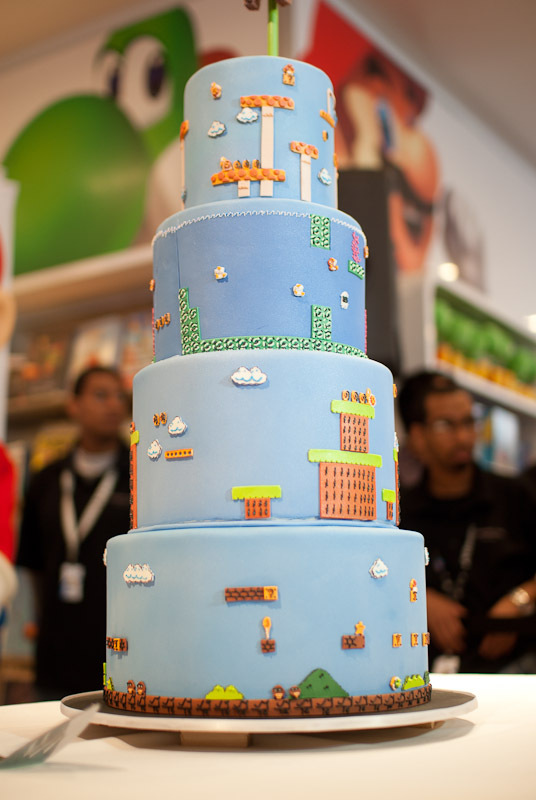 Nintendo had asked 20-year-old Andrew Gardikis of Quincy, Massachusetts -- the reigning champion of the Super Mario Bros. speed-run with a time of five minutes flat -- to attend the celebration and show off his skills. 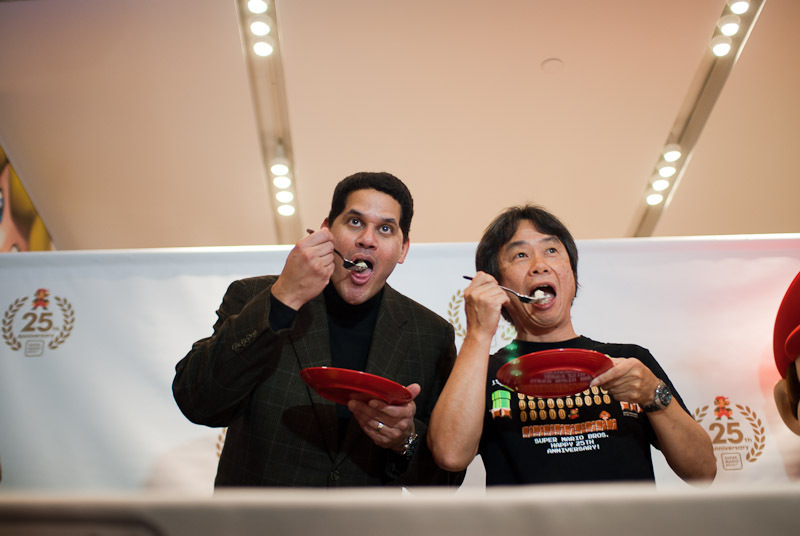 "I didn't do so well, but I was nervous with Miyamoto watching!" Gardikis said of his less-than-perfect speed-run. "I had fun with it anyway, though. I've been playing Mario all my life. It's surprising that it's 25, and it's kind of weird to be the record-holder for a game whose launch I wasn't around for," he said, laughing. 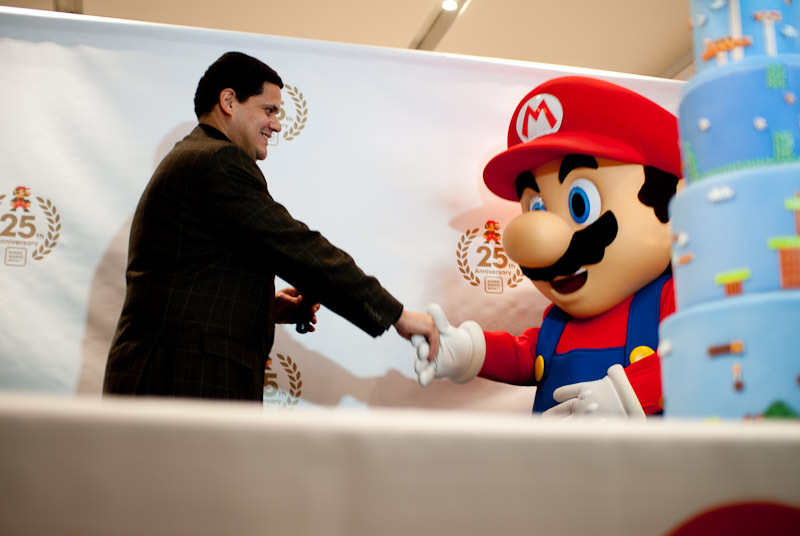 "But I'm really glad I got to be here and meet Miyamoto." 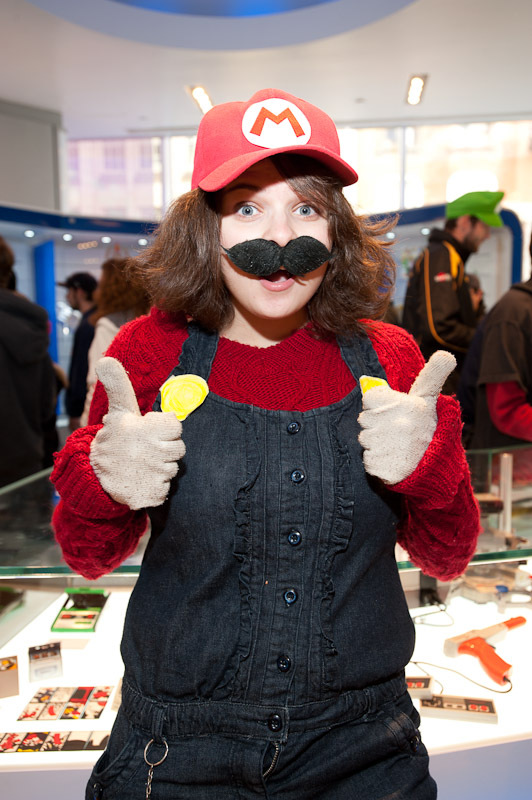 Besides the speed-run demonstration, the event had other activities for the attendees, including a photo portrait area, where fans could have their pictures taken with mushrooms, question blocks, red shells, and even Mario himself; a video testimonial booth, which had people confessing their love for Mario in the style of MTV's The Real World; and the new store museum, which featured various Mario products from over the years -- everything from the original NES to the red, 25th-anniversary edition Wii and DSi XL that were available for purchase at the store. And although there wasn't a costume contest, many fans took it upon themselves to dress up as Mario, Luigi, and even Toad. 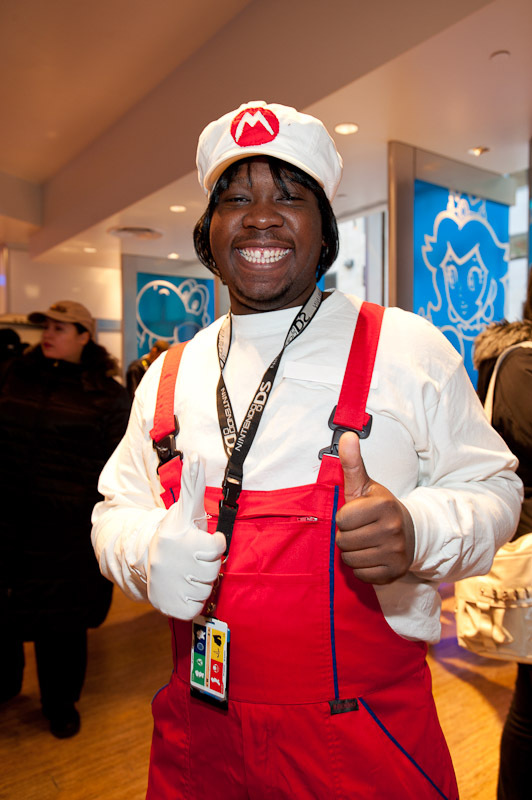 "It wasn't mandatory for me to be in costume at all; this is my own homage to Mario," explained Nintendo World Store employee and passionate Mario fan Antoine, who was dressed up as Fireball Mario. "This is one of those events you can't miss," he added. "Whether I was working or not, I had to be here." 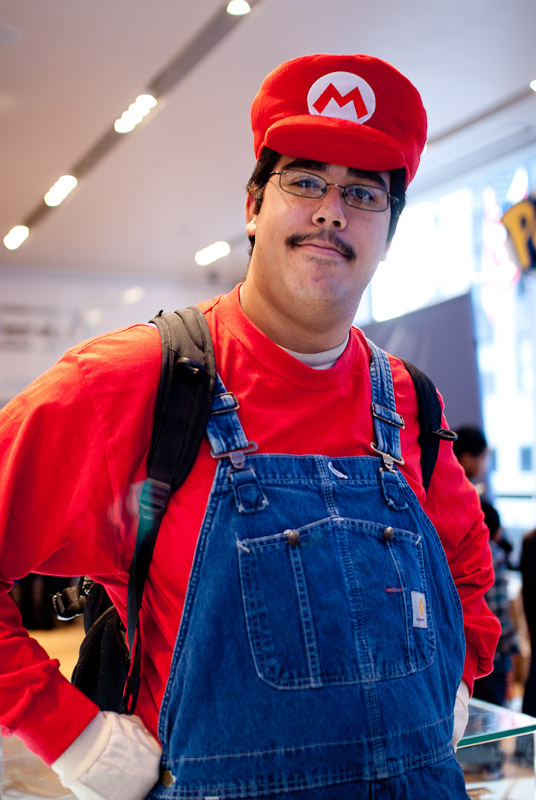 When asked why Mario appeals to so many people, he said, "There isn't a crowd that Mario doesn't appeal to. It's hard not to like him. He's an everyday hero that everyone can relate to. He doesn't have magical powers per se, but he's a down-to-earth Italian plumber from Brooklyn. Who can't relate to that?"